We delve into some of the most commonly asked questions when it comes to hypnotherapy. Hypnotherapy can sometimes feel like it’s shrouded in mystery. Those who don’t work in the industry or those who haven’t tried it before can feel unsure about the practice, and often have questions. Here at Hypnotherapy Directory, our aim is to lift the curtain and show the world how powerful hypnotherapy can be. We want to take the mystery away and educate as many people as possible on the ways hypnotherapy can support us. Below we’ve listed some of the questions we often hear when people want to know more about hypnotherapy. Our hope is to share these answers far and wide and encourage more people to consider hypnotherapy. Can hypnotherapists control me when I’m in a hypnotic state? This is a common misconception. Hypnotherapists aim to put you in a deeply relaxed state and communicate with your unconscious – and while you’ll be more open to suggestion, you won’t do anything you don’t want to do. Many people remain aware of what’s happening in their hypnotherapy session, some feel as if they’ve had a nap and don’t remember the details. This will vary from person to person, but generally, people leave their sessions feeling calm, relaxed and centred. Weight loss – For those looking to be more mindful with their diet, hypnotherapy can be a helpful way of encouraging more intuitive eating habits. Anxiety – A hypnotherapist can help those with anxiety learn how to access a calmer state of mind more easily and increase relaxation. 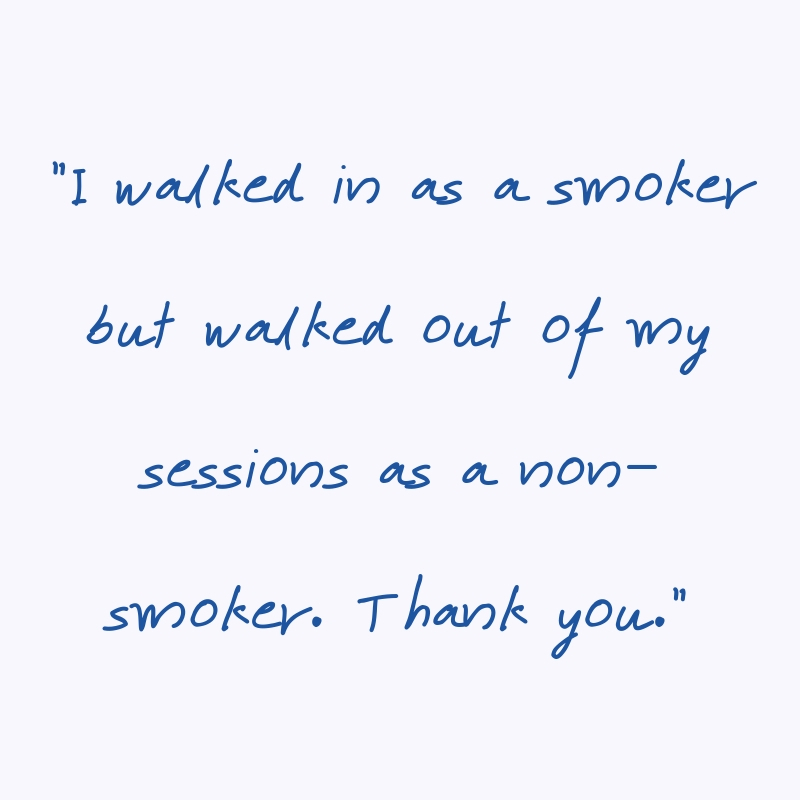 Quit smoking – Powerful at changing habits, hypnotherapy can be an excellent method to quit smoking. Addictions – As with smoking, overcoming other addictions such as alcohol addiction, drug addiction and gambling addiction can be supported with hypnotherapy. Phobias – Many people find hypnotherapy helpful for tackling phobias, including fear of flying, claustrophobia, arachnophobia and much more. Insomnia – Not being able to sleep can affect both mental and physical health over time. Many people use hypnotherapy to help overcome sleep disorders like insomnia. Irritable bowel syndrome (IBS) – Hypnotherapy is recognised by the National Institute for Health and Care Excellence (NICE) as an effective treatment for IBS. Will it work if I’m sceptical? As we mentioned earlier, a hypnotherapist cannot make you do anything you don’t want to. Having a willingness to change and an open mind is key to the success of hypnotherapy. If you go into the session not really wanting to change or totally against the idea of hypnotherapy, you’re unlikely to get the most from it. This will depend on the type of hypnotherapy you’re having and the nature of the problem you’re seeking help with. Some people may only need one session, while others will require longer-term treatment. Your hypnotherapist may also recommend self-hypnosis after your sessions to help you keep up momentum. Having a trusting relationship with your hypnotherapist is important, so it helps if you can find out more about the way they work before booking an appointment. Ensuring they are appropriately qualified and insured is also recommended. We have a nationwide network of hypnotherapists here, all of whom are either registered with a professional body or have shown us appropriate qualifications or insurance. If you use our advanced search you can find a list of hypnotherapists in your local area, then read through their profiles to learn more about them before booking a consultation. If you have questions before booking your appointment, feel free to contact the hypnotherapist and ask any questions you may have. They’ll be more than happy to help. The power of storytelling What is Odontophobia?